With week one of the fantasy football season over and week two looming, I’ve had a lot of friends ask me what “sleepers” still might be available in their league that they could potentially add to their roster. While I’m always happy to give me expert advice to friends and strangers alike (as long as the person asking isn’t in one of the 11 leagues I’m playing in), I do get slightly perturbed by the term “sleeper”. Every year dozens of articles are published seemingly every day talking about sleepers-this and sleepers-that. But the vast majority of the time they are all talking about the same players. If all the popular Fantasy Football websites and magazines are talking about the same sleepers, how much of a sleeper can they really be?! Because I’m not the type of guy who’s going to lazily rehash what everyone else has said about sleepers so far, I am going to make you look like a fantasy genius by identifying some players nobody has ever heard of that at some point could have solid value. So with that, lets take a look at my Super Deep Fantasy Football Sleepers for 2015. Last year a couple of my super deep sleepers were Jacksonville WR Allen Hurns, Kansas City TE Travis Kelce and Minnesota RB Jerrick Mckinnon. Allen Hurns racked up 110 yards receiving and 2 TD’s in week one of 2014 and had a few games where he stood out. Kelce opens up this year as the 4th ranked TE overall and last year totaled 862 yards and 5 TD’s. McKinnon ended up being a hot waiver wire pick up last year for a Peterson-less Vikings team and put up descent numbers in limited time. 1. 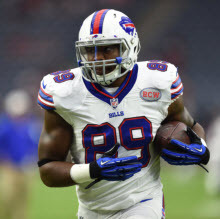 Buffalo Bills TE Charles Clay – Clay was not bad in Miami last year tallying 605 Yards and 3 TD’s. This year he has a chance to get a lot more work in Buffalo’s offense especially with the youngster Tyrod Taylor at QB. Taylor may look to Clay as a security blanket especially early in the season as he feels his way into the starting QB position. 2. 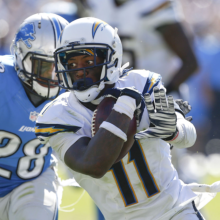 San Diego Chargers WR Stevie Johnson – Stevie Johnson got lost in the shuffle in the dismal offense we know as the 49ers. Johnson is a much better fit in the Chargers offense and has shown to have chemistry with QB Philip Rivers through the pre-season and week one. He could be in for a big year especially early in the season with Antonio Gates missing the first 4 games due to suspension. 3. 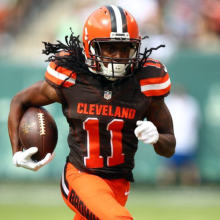 Cleveland Browns WR Travis Benjamin – This guy, my friends, is going to be good! He is a speedster that has fallen victim to the garbage carousel of Cleveland Browns QB’s his first 3 years. This year he has a decent QB in Josh McCown who loves to throw the ball down field and I’m thinking this may be his year. Keep an eye on this guy! 4. Atlanta Falcons WR Leonard Hankerson – The Falcons and QB Matt Ryan love to throw the ball and If anything were to happen to WR Julio Jones or Roddy White, Hankerson is the next man up. We all know that it’s not IF White or Jones gets hurt, its WHEN they get hurt. Neither have been the picture of health with White recently having surgery on his elbow. 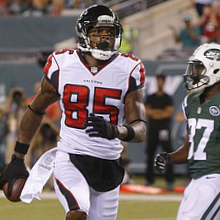 Hankerson is one of the better WR handcuffs this year so put him on your radar. 5. 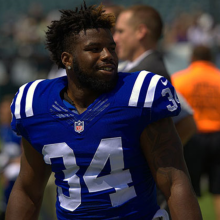 Indianapolis Colts RB Josh Robinson – Running backs get injured more than any other position and the Colts now have an aging Frank Gore as their starting RB. Robinson is behind Gore as the #2 RB at the moment so if anything were to happen to Gore, Robinson would be waiver wire gold in the high powered offense of Indy. 6. 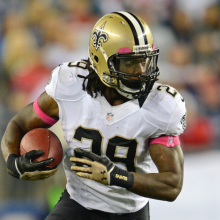 New Orleans Saints RB Khiry Robinson – We all know that the New Orleans Saints love to spread the ball around and with Jimmy Graham and Kenny Stills gone that leaves opportunities for others to get more involved. Robinson is 3rd on the RB depth chart behind Ingram and Spiller but I do not trust Spiller to stay healthy upon his return week 2 or 3. I think that Robinson could be a sneaky source of points at some point this season. 7. 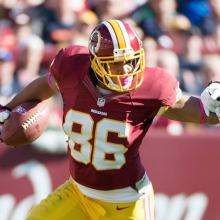 Washington Redskins TE Jordan Reed – The Redskins have a very very shaky offensive line which in turns means QB Kirk Cousins will need to get the ball out of his hands quickly and I think that Reed is going to have a great year. I think Cousins will rely heavily on Reed for quick passes and Reed is a big target that should get a ton of Red Zone looks. 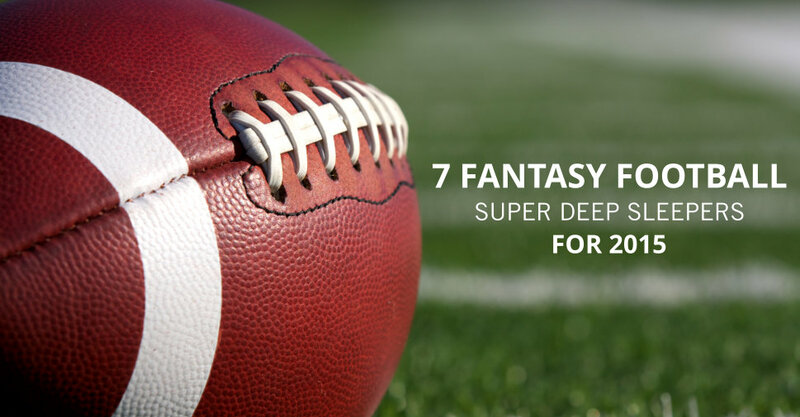 So there you have it my 7 super deep sleepers for 2015. So remember no need to drop what your doing and pick them up but definitely keep an eye on these guys. Do you have any super deep sleepers, please share it with us below. Until next time!